Shea explained that The Harry A. Koch Company has been instrumental in developing one of the most comprehensive auto, general liability, workers’ comp, and specialty insurance programs in the armored car industry. Through this partnership, Rochester has been able to implement effective controls and safety programs that keep operating costs down. 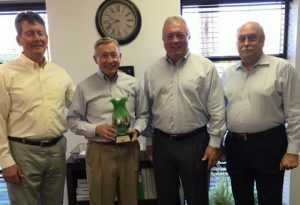 From left to right: J. Andrew Sibbernsen, senior vice president of The Harry A. Koch Company; Joseph M. Shea, president and CEO of Rochester; Jack Specht, senior vice president of The Harry A. Koch Company; and Wayne Peterson, CFO of Rochester. From innovative and customized armored car solutions to our high level of customer service, Rochester has been delivering more than you expect since 1964. Based out of Omaha, Nebr., Rochester has grown to 30 offices in seven states. Each office offers high-quality armored car services and solutions. Our mission statement – With honesty and integrity, to profitably provide the safe and secure transportation of valuables while giving professional and extraordinary service to the customer – is at the very core of all we do. With one of the most experienced management teams in the industry, we excel at listening to the special needs of our customers, creating customized solutions, and providing exceptional service they can count on. Simply put, we are always delivering more than you expect.